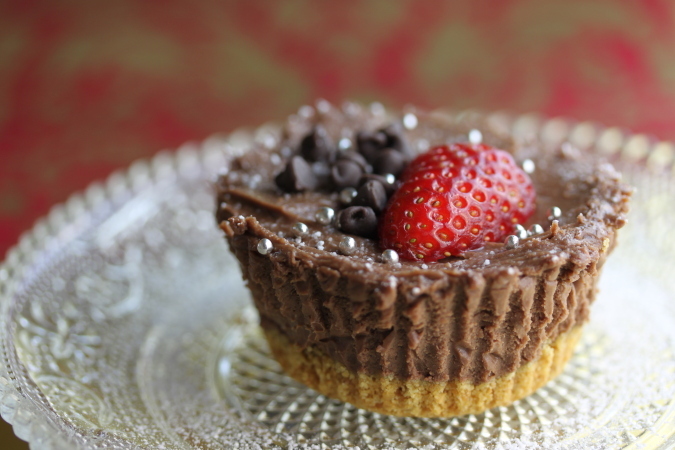 When it’s 100 degrees outside, I head indoors to make cheesecake – miniature no-bake cheesecakes, in muffin tins. Just for fun, I make them in multiple sizes. Part of the joy is finishing the cheesecakes with different toppings: berries, whipped cream, sprinkles…you get the idea. This recipe fills 12 standard muffin cups plus 12 mini-muffin cups (fitted with paper cupcake liners). Or, make several custard cups (again with liners). I suggest one standard muffin cup portion per person, but realistically, some people will clamor for seconds, so give them a mini or two. Serve well-chilled: the filling and crust are more fragile than a baked cheesecake, and are at their best when cold. To tamp down the crumbs in the liners (very important), use the bottom of a plastic-wrapped spice jar, one that just fits the cavity. Jars with tapered bottoms (like McCormick) work great. Espresso powder boosts the chocolate flavor; if you prefer, omit it and the water, and increase the vanilla extract to 1 tablespoon. You’ll need an electric hand mixer or a stand mixer for this recipe, a saucepan, muffin tins and paper liners, and at least 4 hours for the cheesecakes to chill. Stir the crumbs, butter and syrup together until evenly mixed. Place paper liners in muffin tins. For medium tins, spoon about 2 tablespoons crumbs into each cavity. 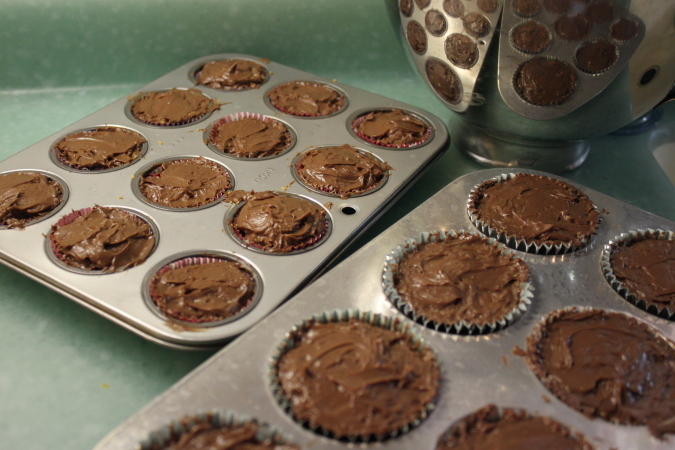 For mini-muffin tins, use about 1 tablespoon crumbs. 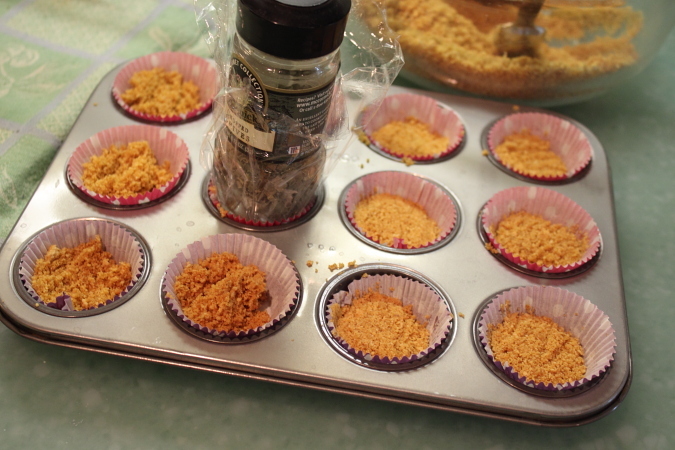 Tamp down the crumbs to form an even layer (see Tips). 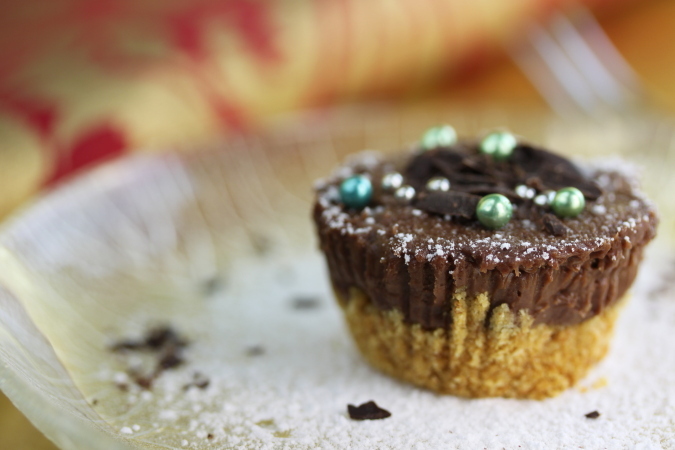 In a small bowl, combine the espresso powder with the water until dissolved. Add the vanilla extract. In a mixing bowl with a electric mixer, beat the cream cheese, powdered sugar, and espresso mixture together until smooth (no lumps). In a medium saucepan over medium-low heat, stir the cream and both chocolates together until the chocolate melts and forms a smooth, shiny sauce. Remove from heat and let cool to lukewarm. Pour the chocolate sauce into the cream cheese mixture. Beat on low to medium speed until uniformly mixed. Layer the filling over the crust in each muffin cavity, adding enough mixture to completely fill the liner. This will be messy. Use two utensils, such as a silicon spatula and a spoon. 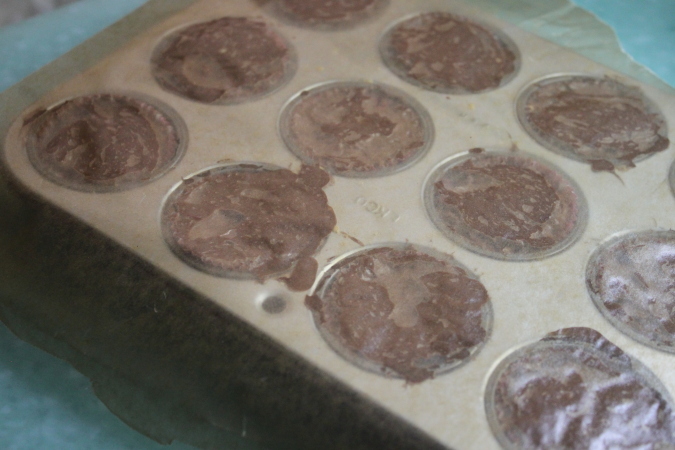 Place a sheet of waxed paper or plastic wrap over the entire muffin tin, and run your hand over it to smooth the tops. Refrigerate until chilled, at least 4 hours and up to 3 days. To serve, peel away the paper liners. Garnish with glee: powdered sugar, cocoa powder, chocolate shavings, sea salt, chopped nuts, whipped cream, or berries. The sky’s the limit. Serve well-chilled (see Tips).